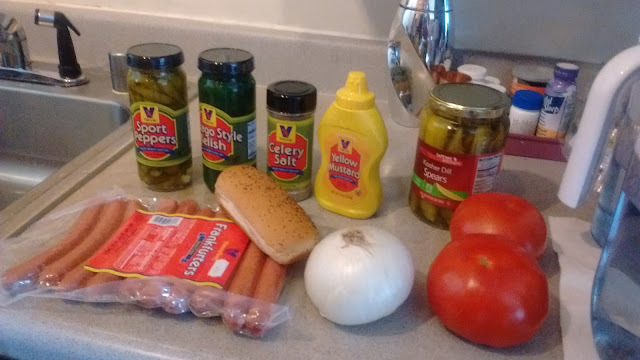 In addition to cheap yellow mustard and a tomato slice, it has a dill pickle slice; sport peppers, which are also pickled; and neon green relish that scares me. Celery salt is shaken on top of the whole thing. If I were going to do a Top 10 Difficult Wine Pairing Ingredients list, dill pickles and pickled peppers would be on there. There's also the overall bleacher-bum gestalt of the thing. You can't have Dijon mustard because that's too fancy. You can't get garlic dill pickles because they're too high falutin'. 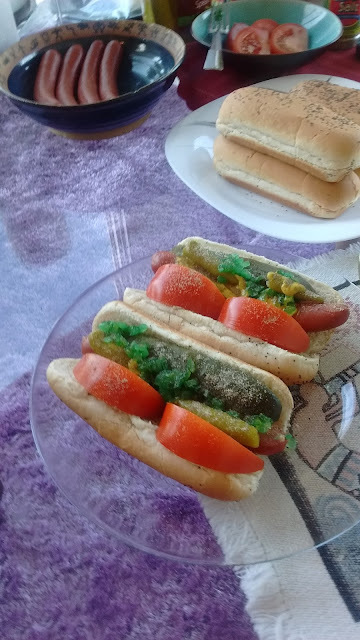 In fact, who in their right mind would even consider wine with a Chicago dog? Which of course made it interesting. I had a few options lined up. The obvious, Spatlese Riesling from the Mosel. A Soave. A pink sparkling wine I expected to be slightly sweet, and a sparkling red wine I expected to be very sweet. 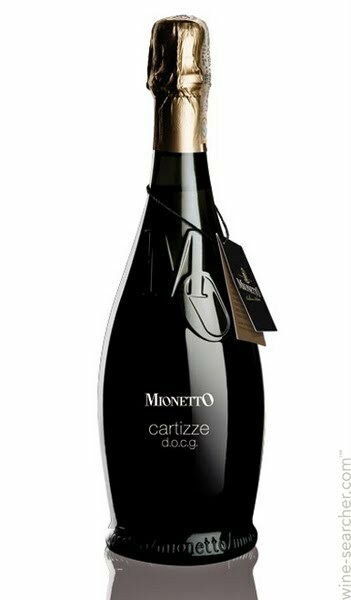 But the winner was the one I projected all along: Prosecco Cartizze, in this case from the large producer Mionetto. I had had the bottle sitting around for a long time because I never found the right opportunity to open it. You expect to make mimosas with Prosecco, share it with your non-oenophile friends, or perhaps pour it over your head to celebrate a championship if you are a San Francisco Giants fan. But Prosecco Cartizze costs too much for that. Most Proseccos cost less than $10. This one goes for nearly $35. Cartizze is a small area inside Valdobbiadene where the best grapes are believed to come from. However, the nature of these grapes is that the wines are considered best with residual sugar. Most Prosecco Cartizzes are at least slightly sweet; some are very sweet. I went to Valdobbiadene once and tried some dry Prosecco Cartizzes, and no, they aren't very good. So I had this bottle of Prosecco that's slightly sweet and pricey and there was just never the right opportunity for it, until Tuesday. But like the Cubbies, it was just waiting for the right moment. It was perfect! This version was barely sweet; it was elegant, more Champagne-like in its mouthfeel than you expect Prosecco to be. You need a little sweetness for the peppers and pickles, and this was delicious. Buy it here. I realize most Cubs fans would have just had an Old Style, but you know what Cubs fans: how's that working out for you, championship-wise, stocking Old Style in your fridge waiting to pour it over each others' heads? Maybe a little Chicago-dog-friendly bubbly is what you need to change fate. Though this is an even year, so good luck with that. Naturally that's only available in NY :P They always get the good stuff first. It's available anywhere that wine can be shipped to, 36 states I believe. Though I can't argue that they get good European wines before the rest of us. But I've got some great California wines here that New Yorkers never see. How did the Spatlese Riesling from the Mosel pair? Paralleling your Cartizze experience, I found that an off-dry to lightly sweet Vinho Verde with good spritz worked brilliantly with a variety of compounded dogs; it's cheaper, too!